How to get gardening with your kids. Embrace springtime by planning edible landscape with youngsters. A garden’s natural ingredients supply nutrition for your body and the environment. Plus there is nothing better tasting than fresh-picked zucchini, spinach, sweet peas, tomatoes, bell peppers, mint and other bounty. You can even grow an organic vegetable garden at home. Why go organic? Growing organically allows you to eat straight from a chemical-free garden while creating a healthy place for worms, insects, bees and birds. Use soil with the right balance of vitamins and minerals by relying on compost. Decide if you are going to grow plants directly in the ground, in a raised bed or in containers. Choose a safe spot that is protected from animals and close to a water source. Select a place that gets sun for most of the day. Buy high-quality seeds and seedlings. Plant seeds according to the appropriate season. Water soil around plants in the early morning or at dusk. Give lots of TLC to your plants because they give so much to you. For typical garden activities, use a large shovel, hoe and rake to create raised beds. Good for small children, hand shovels and rakes are used for planting and weeding in beds. I don’t recommend buying “kids’ gardening tools” because they are typically low quality and break easily. 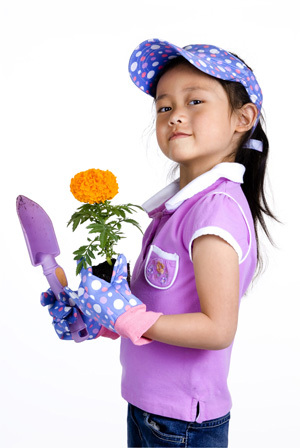 Wear protection, including sunscreen, a hat, shoes and gardening gloves that can get dirty. Hydrate with water placed in a shaded area in the garden while teaching or working. Use gardening tools appropriately (no swinging, swatting or throwing). Set equipment face down in the garden with backs up. Dig a hole in a sunny spot (or invest in a compost bin) and begin to fill the hole with organic material, such as fruit and vegetable scraps, eggshells, old tea leaves, coffee grinds, newspaper clippings and old plants with no trace of disease or bugs. Do not place weeds in the compost; it will grow weeds in the compost. Avoid meat or dairy products in the compost because it attracts animals and takes longer to break down. Cover the organic material with soil and continue to turn the soil using a shovel. This aerates the compost and helps it break down. Water the compost if it looks dry. Dig for worms to see how healthy the soil is. Allot three to six months for the organic matter to turn to nutrient-rich soil. Annual plants bloom only one season and then die. They must be replanted the next year (for example carrots, lettuce and broccoli). Perennial plants continue to bloom every year after they have been established in the garden and therefore do not need to be removed (for example asparagus, mint, sunchokes and chamomile flowers). The best advice when trying to determine what to plant is to go through your favorite recipes and plant their fresh ingredients. This helps reduce the cost of food shopping and ensures your hard work gets eaten. Consider the following in early spring from seeds by Johnny’s Seeds or Seed Savers: spinach, kale, lettuce, carrots, parsnips, sweet peas, green beans, radishes, zucchini and potato eyes. By mid-May, purchase seedlings from a reputable local nursery for tomatoes, broccoli, parsley, bell peppers and a variety of herbs like basil, oregano, thyme and lavender.